Imagine getting the benefits of Botox, serums or vitamins with no pain. Think virtually painless micro needling, and you will understand AquaGold. 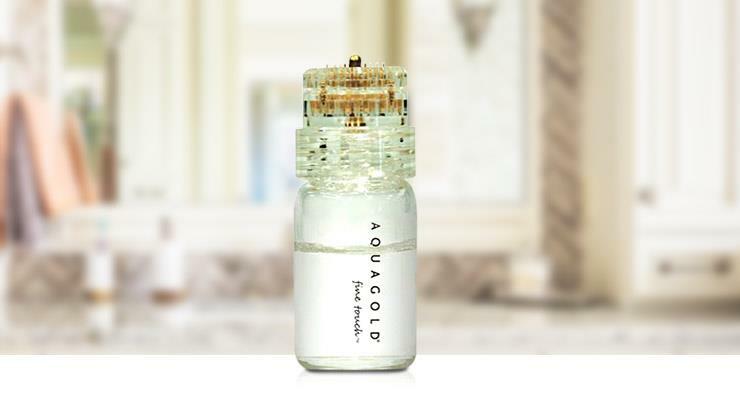 AquaGold fine touch is a patented gold-plated hair-fine needle system designed to painlessly deliver custom solutions into the skin just under the dermis, not on it or underneath it. This creates a soft, natural-looking result, leaving the face looking smoother, tighter and rejuvenated. Applying anti-aging products directly under the skin allows them to be absorbed much more effectively and with a much longer duration of effectiveness because these products do not have to bypass the natural protective barrier of the skin. Unlike many dermal fillers injections, the treatment does not require an anesthetic. The AquaGold fine touch tool has 20 hollow, gold-plated stainless-steel needles, which are 0.6 mm long and 0.13 mm wide; thinner than human hair. The needles sit on a platform, which is pressed into the skin in an overlapping pattern. The tool has a reservoir on one side to hold the ingredient(s) that will be inserted into the skin and with each “stamp” of the tool, the ingredient(s) gets pushed in at the ideal 600-micron depth, the dermal level, rather than the muscular level. The AquaGold is considered a micro-channeling delivery system due to the tiny superficial holes that are created in the skin. This stimulates collagen production and distributes active ingredients at a consistent depth over a large surface area. The consistent distribution results in a healthier and more vibrant appearance of the skin. Patients will see an immediate improvement on the treated area, whether it be the face, neck or décolletage. There is little or no down time after a procedure and no restrictions beyond not washing your face for a few hours. Slight redness may be observed for a short time, but there will be no bruising or a “frozen muscle” look.